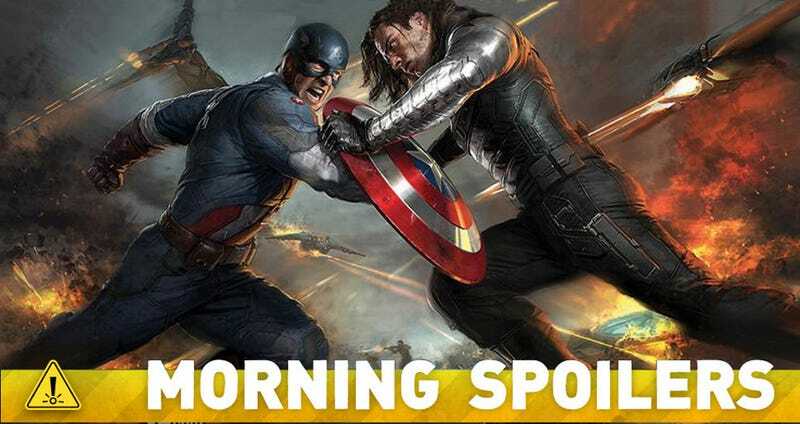 Major Reveals for Wolverine, Agents of SHIELD... and Pacific Rim 2? Take a look behind the scenes of Godzilla and R.I.P.D. The Strain has cast an ancient vampire. S.H.I.E.L.D. will directly pick up a movie story line, but not the one you think. Sam Mendes is directing the next James Bond film. Plus see new images from Seventh Son, Frozen and Spider-Man 2. Spoilers ahead! Top Image: Captain America: The Winter Solider concept art. In run up to Comic-Con Entertainment Weekly has published more images from The Amazing Spider-Man 2, including this one of Paul Giamatti as the Rhino. Well, he’s kind of a guy who invented himself. He’s looking for a way in this world to satiate his unending appetites. He’s self-indulgent – he’s a complete hedonist. He loves dressing a certain way. He loves having the right wristwatch, the right car, the right plane. He’s that guy. So he doesn’t have a particular moral compass, and he doesn’t have a particular set of political affiliations or idealistic affiliations. He’s just a war profiteer, and he doesn’t even make a judgment call on the number of lives he’s stepping on in order to serve his insatiable financial needs. So he’s a pretty superficial guy, but he’s also very theatrical, because the choice to have Ron Perlman play a guy named Hannibal Chau, right there you’re making a decision up. In a Q&A following a screening of Pacific Rim, Guillermo del Toro gave some major clues as to where a sequel would go, if one actually happens. These hints are majorly spoilery, so if you don’t want the first movie potentially ruined skip down to the clip below…. In the movie pilots merge with their co-pilot via “drifting”, melding minds and memories together. During the film one character “drifts” with a Kaiju mind to understand the enemy better. Del Toro says this drifting would be a central plot point in a sequel. He remained vague about what a human drifting with a Kaiju meant, but emphasized they were more complex creatures than humans understand. Could humans learn to control Kaiju as living war machines? Also, he said this end of the film might not be the last we see of the Jaeger Gipsy Danger. The Jaeger is seemingly destroyed on the other side of the bridge between two worlds. So what does that mean? The Kaiju now have Jaeger tech? The show will tie into the movies, as producer Jed Whedon explains: “We plan on trying to weave in between the films and try to make them more rewarding on both ends.” The pilot immediately picks up a storyline from one of the Marvel movies — but it’s not one from The Avengers. Nick’s zombification in the season finale is not going to be a quick and easy fix. Executive producer Jim Kouf says, "If Nick does survive this zombie state, he's going to be very dangerous. There will be residual effects that will change him in a huge way." See picture below. Steven Moffat talks about the upcoming regeneration of the Doctor. Well, I’ve known broadly speaking for a very long while because I knew how long, when he first came in, he was broadly speaking intending to do. And obviously, being the man I am, I always tried to persuade him to do longer and to do more and he [stayed] a little bit longer than he intended to. I knew that he would do what most of them do and do his three years. It’s a difficult thing for any departing Doctor. Executive Producer Greg Plageman hints at where the evolving intelligence of the machine might be taking the show. We think that the franchise of the show, in the sense of, will the machine continue to distribute numbers? The answer to that question is yes. The question is: Is it just relevant and irrelevant numbers? Or, is there a new aspect to the machine's growth and what it's endeavoring to do. We talk about A.I. [artificial intelligence] a lot in the writers' room. What is happening with the machine? It's a lot of fun. And, we think one of the central interesting stories to tell would be, if you believe the majority of people out there don't have a sense of outrage about what has happened with privacy in this country, what if there were an entity that did? We think that is a very interesting area to explore.